HSENI Chief Executive, Keith Morrison; GAA Monaghan captain Darren Hughes and former UFU President Ian Marshall at the NSA sheep event. 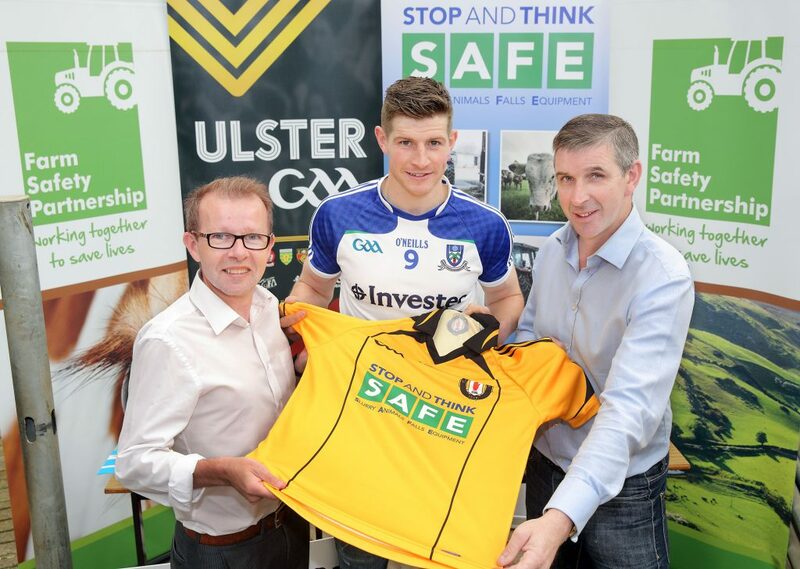 The GAA and the Ulster Farmers’ Union (UFU) have teamed-up to support Farm Safety Week. Running this week (July 6 to July 10), the 2015 Farm Safety Week focuses on falls, machinery, slurry, crush injuries from livestock and child safety. In Northern Ireland from 2000 to the end of June 2015, there were 102 farming deaths, it says. UFU President Ian Marshall says that these figures serve as a reminder that farming is a dangerous occupation and it is important we educate the industry, including young farmers, about the risks. The UFU says it is encouraged by the willingness of the GAA to get on board and help promote the message of farm safety. It’s clear that they are serious about this issue and their commitment to rural communities makes the GAA an invaluable ally in helping raise awareness and in changing attitudes towards safety. 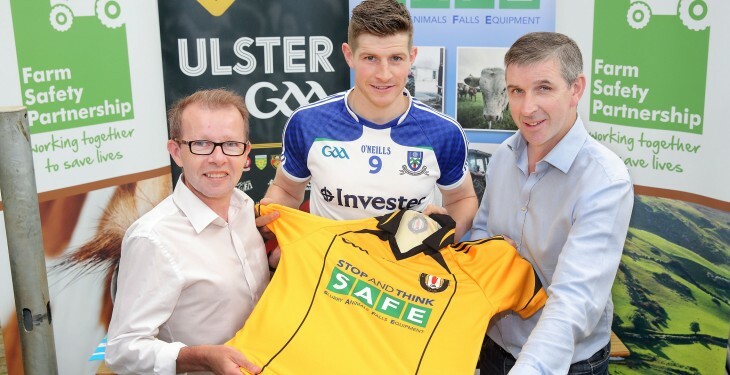 To highlight the importance of farm safety, and to help raise awareness, Monaghan GAA senior footballer, Darren Hughes, attended the National Sheep Association (NSA) sheep event in Ballymena to lend his support. “Having grown up on a dairy farm in Scotstown, I’m very aware of the dangers and how easy it is for an accident to happen. “I’m confident that the GAA’s relationship with the Farm Safety Partnership will help highlight the importance of farm safety and will hopefully help shift farmers and their families towards a more ‘stop and think safe’ mind-set,” he said. Over the course of the week there will be themed practical advice and guidance for farmers to drive up health and safety standards on farms, the UFU said. Farmers are being encouraged to take five minutes to assess the safety of some routine tasks so they ‘don’t learn safety by accident’.